Ken Cuccinelli, former Attorney General and Republican Gubernatorial candidate in Virginia, poked fun at supposed “juggernaut” Hillary Clinton and offered praise to GOP congressional candidate Dave Brat. Juggernauts are only juggernauts as long as they stay looking like juggernauts. And she doesn't look like a juggernaut anymore. She’s going to have some things to deal, and there are some common themes here...Last month, the same media was talking about how dead the conservative grassroots was, okay? And now we're talking about how the entire 2016 campaign is going to change because of the conservative grassroots. 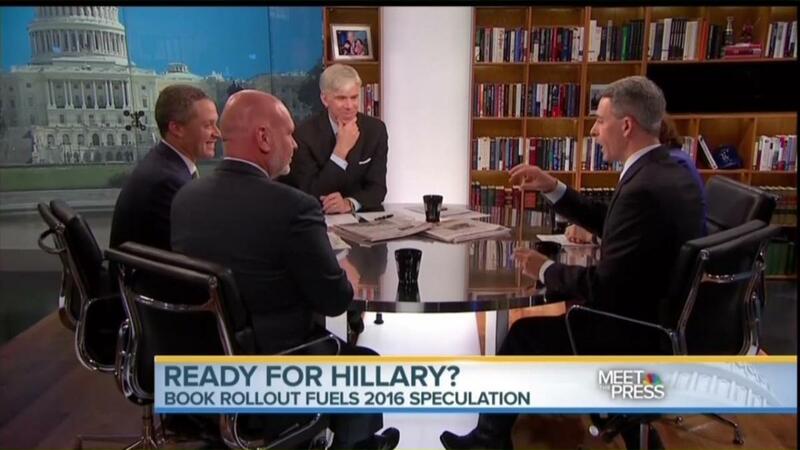 DAVID GREGORY: Hillary Clinton, Harold, a week of rollout on her book, the dead broke comments. Is she in a better position or a worse position now that she's getting a little bit more of the rough and tumble? HAROLD FORD JR: Look, they have to go back and regroup. She’s got to have some tighter, easier to connect and understandable answers around her wealth, which I don't think is really an issue. Most people running for office who have been out have found ways to make a living. I don't think voters punish. Voters won't vote for someone they have issues with or may not like, but they won't vote for someone who they don't believe likes them or respects them and she can easily get back there. She fought her whole life for those things but she had a tough week. And they got to figure out how you get back to answering questions. Her husband was the best at stepping back, looking at the moment, understanding that people want answers to their own problems in their homes and their communities, how you create jobs, how you increase wages, and how you make the country safer. And if there was ever a time when the country was confronted with these questions, your first seven which I thought was excellent with the roundtable talking about Iraq and the challenges we face there going forward. We're looking for candidates for public office, particularly at the federal level, who can answer those questions. And if she does that well, she will find herself right back where she wants to be. KEN CUCCINELLI: You know, juggernauts are only juggernauts as long as they stay looking like juggernauts. And she doesn't look like a juggernaut anymore. She’s going to have some things to deal, and there are some common themes here. Eric Cantor looked like a juggernaut. Frankly, Thad Cochran looked like a juggernaut. Last month, the same media was talking about how dead the conservative grassroots was, okay? And now we're talking about how the entire 2016 campaign is going to change because of the conservative grassroots. FORD JR: But, Ken, who can bring national -- the demographics nationally for Republicans are clear. You've got to figure out ways to grow the tent. So the message that some of what you're talking about and some of what Dave Brat is talking about, how does that grow the tent to help the Republicans out? RUTH MARCUS: They're great at connecting. CUCCINELLI; Yeah, he's a conservative professor so he's covered by the Endangered Species Act. Look, he connected with how these policies affect people in their real lives. You know, I hear your characterization of employment, you know, growing employment but not growing wages. There isn't growing employment. There are less people in the employment market than there were six years ago. FORD JR: We have grown employment, but wages have not grown. GREGORY: Quick comment Ruth and then I can get a break in here. CUCCINELLI: The middle class is scared to death. And they see opportunity in shrinking government and turning that opportunity over to the private sector. MARCUS: To get back to Hillary, Harold is right, she didn't have a great week. I think it's a little premature to declare the juggernaut over. But in a sense, Eric Cantor did her a favor in two ways, not just by changing the 2016 landscape, but he changed the conversation. Campaigns & Elections 2016 Presidential 2014 Congressional NBC Meet the Press Dave Brat Hillary Clinton Ruth Marcus David Gregory Ken Cuccinelli Harold Ford Jr.